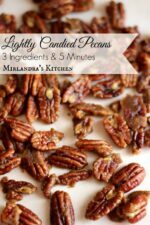 Candied Pecans with a kiss of dark brown sugar and butter, perfect with pumpkin pie or alone in a dish. Only three ingredients and 5 minutes. Easy as pie! We just have four days left until Thanksgiving! This is of course my very favorite day of the year. It is better that my birthday or even Christmas! On Thanksgiving I can cook as much as I want and nobody thinks I’m being outrageous. Well, the year I made 17 pies for about 6 people there were some comments but that year I was really on a pie kick so nobody was that surprised. Besides, then there was ammo for a pie fight… I guess I should mention my family can be quite playful and even shall we say silly at times? Most people I know will be baking a pumpkin pie this week. I asked around and competent bakers said they had as many as 90% of their pumpkin pies split. It happens to be best of us. A few minutes too long in the oven, or the pie cooling down to fast causes splits and sometimes separation from the pie crust. The solution of course is magic. However, if you don’t know any pie magic (which puts you in the same boat as me) I suggest some lightly candied pecans. They are sweet with a subtle sugary crunch and very popular every time I serve them. I like to make a bowl anyways to go with desserts like carrot cake and pie. The advantage is that if anything goes wrong with a pie I just arrange a few pecans on top and it looks beautiful anyways. I don’t know about you but not everything I cook looks Pinterest perfect. At the end of the day what people will remember is how amazing it tasted! Trust me I have a friend who is still talking about an apple crisp I made him about 14 years ago. These are also a great hostess gift if you are invited over for The Big Dinner and for the all important bonus………THREE INGREDIENTS AND FIVE MINUTES! Did I mention this is a great recipe? If you are looking for a slightly different flavor by all means dust a little cinnamon sugar or some pumpkin pie spice on the nuts while they are hot. Enjoy! 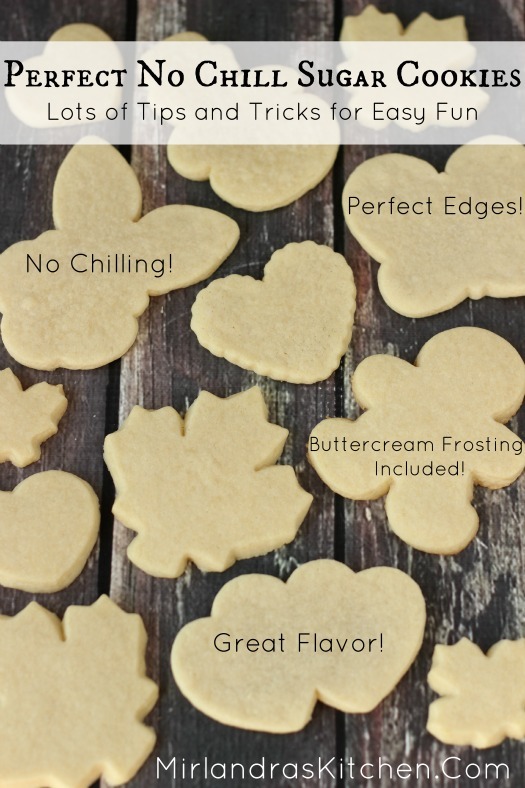 If you are in the market for more holiday cooking on the simple side make sure you try my No Chill Perfect Sugar Cookies! These cookies are scrumptious, simple and readers are giving me a lot of feedback that they are one of the best cookie recipes they have ever used! Lightly candied pecans with a subtle sweet, crunchy crust. Ideal for snacking or to serve alongside dessert. I love them with pumpkin pie and whipped cream. Line a sheet pan with wax or parchment paper. Set aside. Melt the butter over medium-high heat. Stir in the pecans with a wooden spatula. Add sugar and stir constantly for two minutes. Spread candied nuts out on paper. Use the spatula to separate them so they are not touching. When the nuts are completely cool store in a airtight container. Hannah tipped me off to sugared nuts in a skillet. But butter! Oh, that can only make everything better. It really is lovely! I have always made brown sugar / sour cream nuts in the past and they are wonderful but heavier. These are so light and savory they compliment other desserts or appetizers very well! I also think they are a very easy way to start to learn about how sugar caramelizes in candy making. I think your oldest kiddo could do these himself with a little supervision. Yes oh yes! I have been eyeballling the bag of pecan halves in my freezer, wondering what I should do with them before leaving for FL…they need to be eaten, and this is how we will be enjoying them. =D LOVE that it’s lightened…yum. Thanks so much for sharing with us at Weekend Potluck. Keep ’em comin’! And enjoy a delightful weekend. Oh yum! Nothing quite like “having” to use up a good bag of nuts. Hope you have had a great week! Congrats on receiving MOST CLICKS at last week’s Weekend Potluck party with this winner of a recipe. I can’t wait to make it – today’s the day! Enjoy a wonderful Christmas week ahead. We’ll see you back at our party in the new year! Thanks so much for your faithfulness to share with us. Thank you! I am so happy everybody liked it so well. I might be a bit spotty in January with baby coming that month but I will come visit as much as I can! Thanks for posting this recipe….been wanting to make these…..and am going to make them tonite…..
And will make the sugar cookies later…..
Just saw this on Pinterest! Oh my, I might even sprinkle lightly with cayenne pepper for a surprise kick. yummy! just yummy!! made these tonight for a salad. perfect! DO YOU HAVE A RECIPE FOR SALTED CHILI FLAVORED PECANS ? THANK YOU FOR YOUR RECIPES . I don’t right now but it sounds completely wonderful. Now I am most curious to have some! Nope! Quick and easy on the stove top with no baking required. Makes life simple!